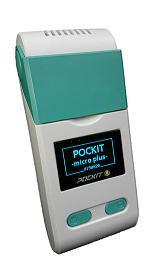 POCKIT Micro Plus Nucleic Acid Analyzer Wins 2018 Taiwan Excellence Award. It’s our great honor to share with you that POCKIT Micro Plus Nucleic Acid Analyzer wins 2018 Taiwan Excellence Award. We won’t be satisfied by it. Instead, we’ll devote as much effort to research and develop the best detection products and service worldwide and down to the extreme of Point of Need market.